Hello ARK Survivors! 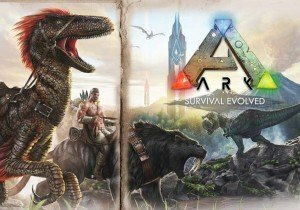 ARK: Survival Evolved has become the fastest growing Early Access title and most-played open world survival game ever due to our wonderful fans! Over the first week the game has seen nearly 450,000 units sold and more than 64,000 concurrent users amassing 6.5 million hours of game time. ARK survivors have shared some amazing pictures, tweets and videos of in-game creations with us. During “Jurassic ARK Week” Studio Wildcard is hosting fun events, contests and releasing new in-game content to thank everyone for making ARK a success. You have the chance to win a Fandango e-gift card during a daily screenshot/video contest, as well as submit amazing Jurassic-themed memes. On Friday we’re having an ARK-wide special event to coincide with the release of the latest movie from the best-selling franchise, Jurassic World! On that day the ferocious and versatile Spinosaurus will start to stalk the waterways as an awesome all-terrain combat mount. Also, for one week only you’ll be able to acquire special Jurassic-themed cosmetic items dropped by high-level predators. Each day three winners will be selected whose ARK in-game screenshots or video best fits the daily theme. The first place winner will receive a $100 Fandango e-card, second place will receive a $50 Fandango e-card and third place will receive a $25 e-card. Send entries to contests@studiowildcard.com. Winners will be announced on the ARK Steam forums at 5pm EST each day. • Wednesday: “Coolest Base” – Got an amazing home base or fortress to show off? Give us a tour! • Thursday: “Coolest Tribe” – Get your Tribe posing together and showcase your creativity. • Friday: “Most Epic Environmental Shot” – ARK is filled with amazing vistas and incredibly detailed environments. Find your favorite area, position the shot and send it in. • Saturday: “Official Server Broodmother Trophy Shot” – One of three Primal Gods who watch over ARK, the Broodmother Lysrix stands as a giant over all other creatures. Always accompanied by a vanguard of her broodlings, the Broodmother stands ready to take all challengers who might, in their hubris, seek to oppose her. You must get a conquering shot (with Pause Menu to confirm the official server) and send it in to qualify. Bring friends, you will likely die! • Sunday: Line up every tamed creature you have on an Official PvP Server (denoted by the pause menu). Impress us with the amount and diversity of creatures you have trained. • Bonus Entry: Each day during the contest a new Jurassic ARK meme from the community will be promoted in the Steam community forum and released from @survivetheark. • The Spinosaurus: This gigantic terror of the lakes and waterways is based on the latest research indicating quadrupedal movement and an amphibious nature. Spinosaurus will at last be stalking the many lakes and waterways as an all-terrain mount. Beware his ferocity! • Tribe Governance Features: Do you want to be a full utopian Communist where everything is shared, rapacious Capitalists with absolute private property, or something in between? • New Structures: The Metallic Spike Blockade for stopping incoming Dinosaur attacks, and The Food Storage Bin for preserving food over extended periods of time and for turning beef into jerky… mmmm beef jerky! • Flying Dino Update: Flyers can now carry other dinosaurs, not just humans. C4-Packing Dodo Air Drop anyone? • Balancing & performance improvements, new resources, and more! Nexon America has launched Dragon Nest's latest update, Chapter 6: The Astral Coven.